Oblique aerial view centred on the railway viaduct, taken from the SE. Oblique aerial view centred on the railway viaduct, taken from the WNW. 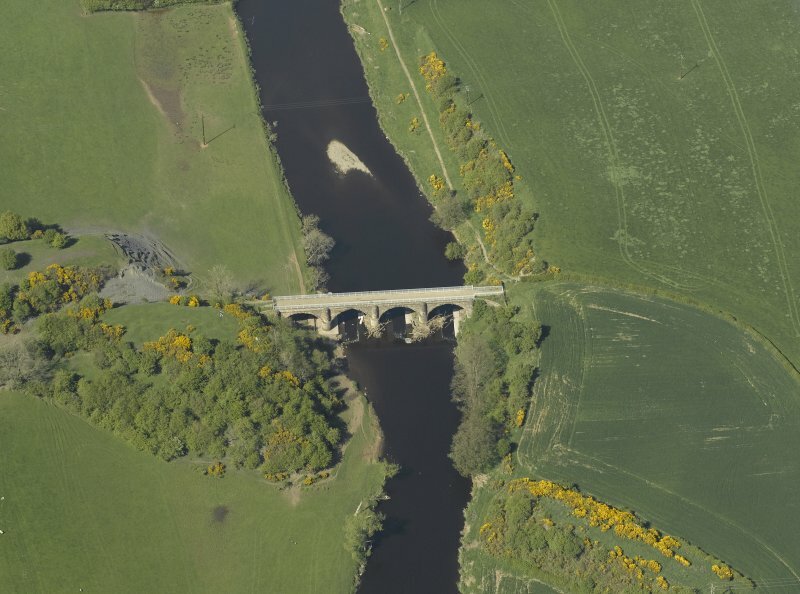 Oblique aerial view centred on the railway viaduct, taken from the N.
Not to be confused with Gatehead, Ralway Viaduct (NS 38238 36550), for which see NS33NE 29. (Location cited as NS 383 369). 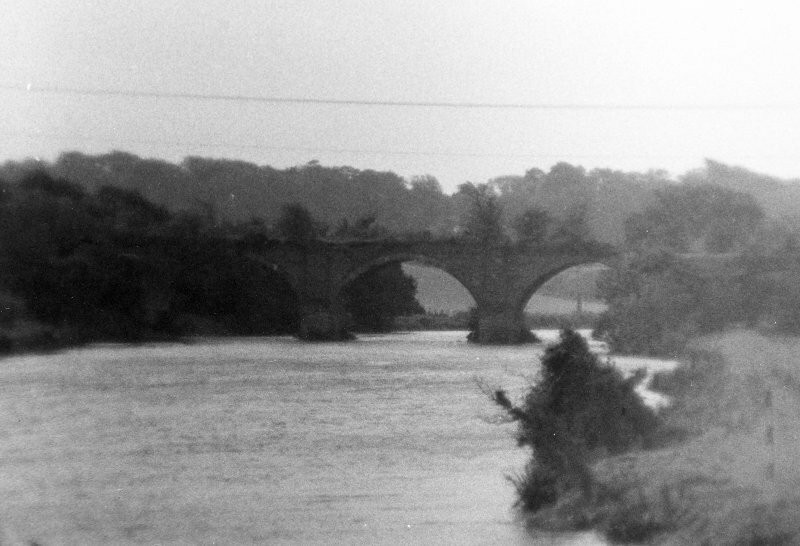 Railway viaduct, Gatehead, opened 1812 by the Kilmarnock and Troon Rly. 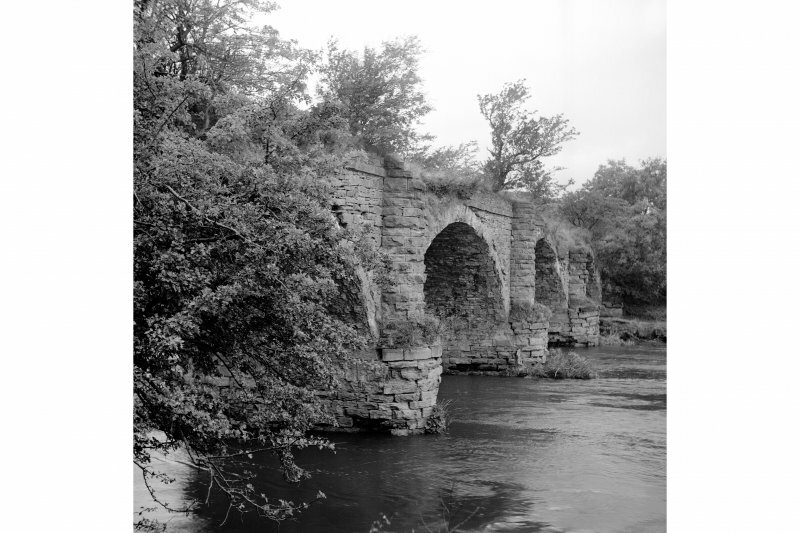 A 4-span bridge, with dressed-stone arch rings and rubble spandrels and piers. The arches are segmental, and there are rounded cutwaters, extended up to form semicirculat buttresses. In poor condotion. 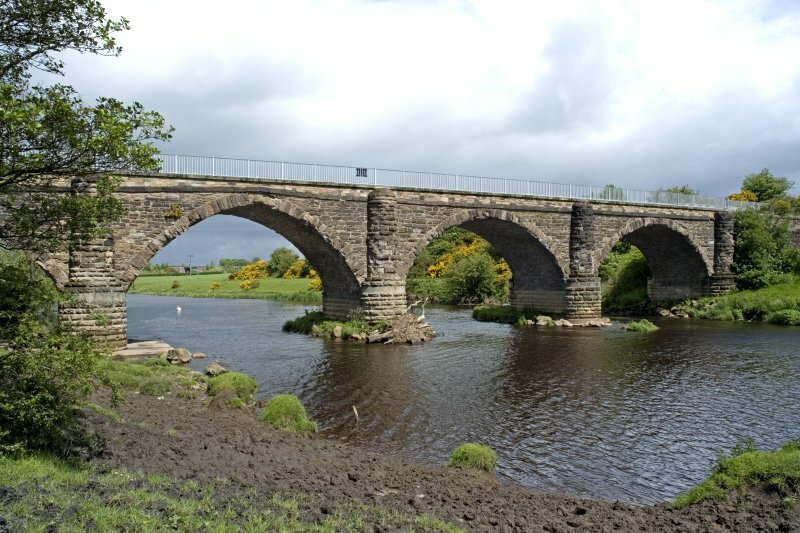 The oldest railway viaduct in Scotland. 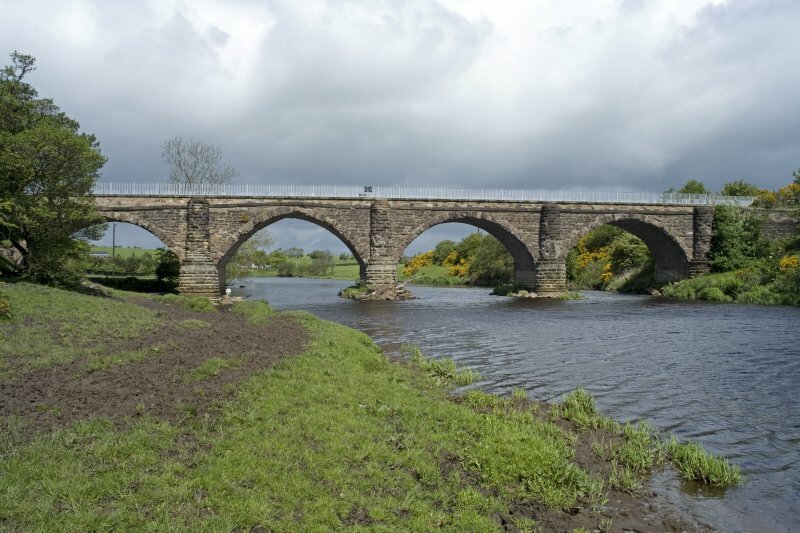 The first public railway in Scotland ran from Kilmarnock to Troon. It was opened in 1812. The track, of plateway type, (4ft gauge) remained until the line was converted to locomotive haulage after the take-over by another company in 1846. When the line was relaid, one of the original bridges (at NS 3835 3689) was bypassed and still survives. Otherwise, the present line follows the original plateway very closely. A bridge of sandstone blocks. A four-span bridge, in poor condition. The oldest railway viaduct in Scotland. Part of the original track extends W of this bridge to NS 376 368. Visited by OS 25 May 1982. 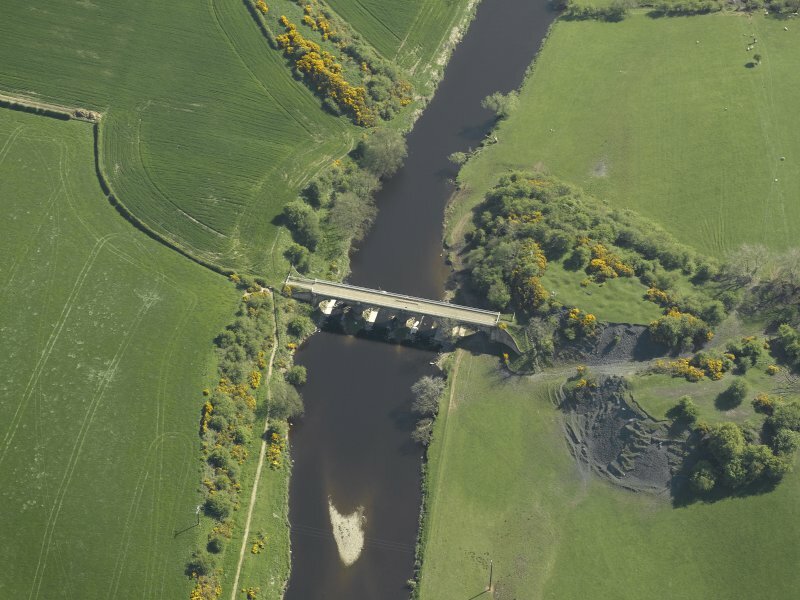 NS 3834 3689 During refurbishment of the Laigh Milton Viaduct, Barr Construction required an electricity supply to their site compound. 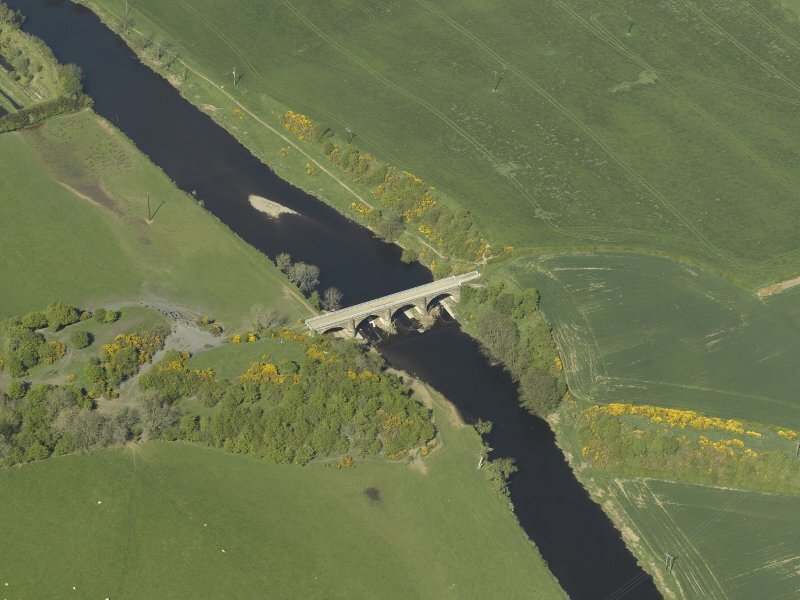 The proposal to construct this supply was monitored through the standard procedure already set up between the Strathclyde Joint Archaeology Service (SJAS) and Scottish Power. 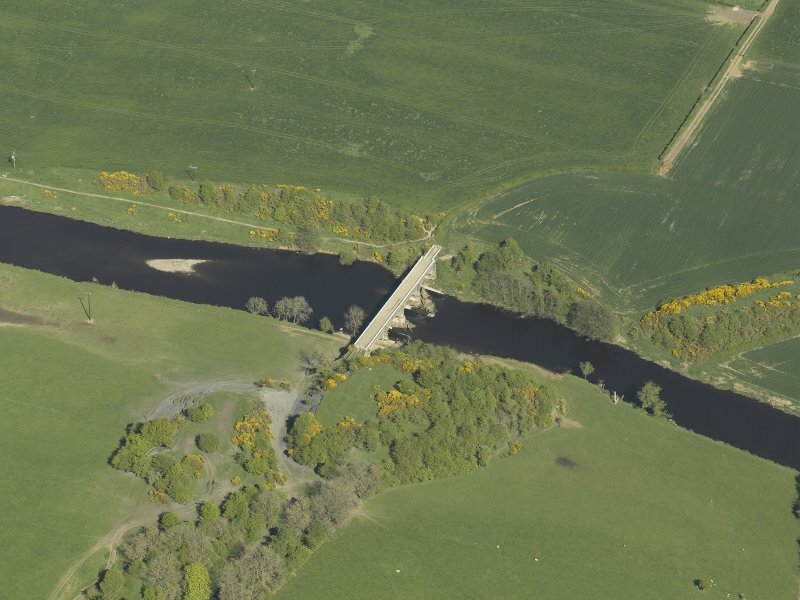 It was noted that the proposal as it stood would affect the eastern end of the viaduct, where it meets the high river bank (a fluvioglacial terrace). This is a location where information about the construction of the site could have been lost. Hence Scottish Power were asked to find an alternative way of supplying the electricity. The chosen route was examined in August 1995. The trench to house the cable was dug into the surface of the newly forged track to a depth of around 1m. It ran up the track to the top of the E end of the viaduct before being routed eastwards along an existing drain (which runs to the S of the hedge that marks the northern side of the original line of the railway). In this trench evidence for the artificial construction of the ground in the form of a ramped platform between the end of the viaduct and the fluvio-glacial terrace was seen. The ramp ran from the top of the viaduct (from around 0.3m below the existing surface) N, running flat for 2m before sloping down steeply (at about 50 degrees) until it ran out of the bottom of the trench at a point some 4.2m from the northern edge of the viaduct and around 3m lower than the existing surface. Overlying this context was a mixed, blackened layer containg cinder, mortar and small bits of red brick. No artifacts were recovered from the clay layer but it was sufficiently different from the natural boulder clay that covered the terrace to tell it was not a natural deposit. Also it was directly overlain by obviously 20th or 19th century artificial material. 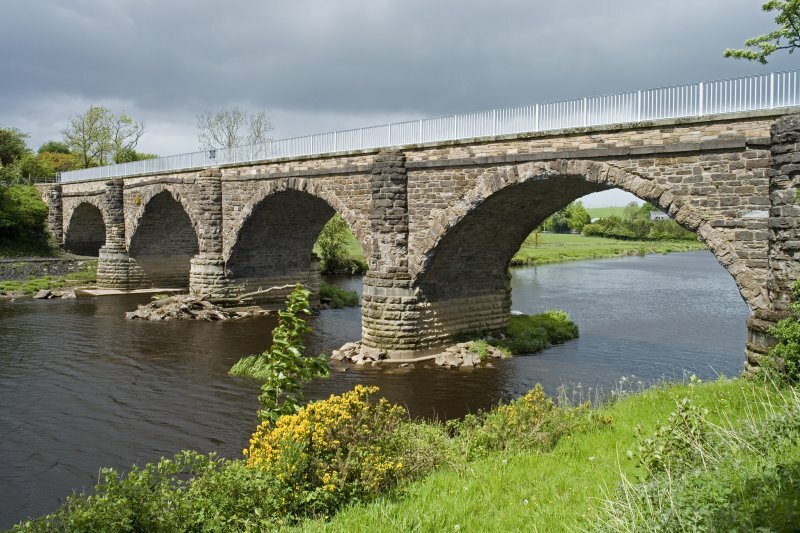 This viaduct is about 270 ft (82.3m) long by 19ft (5.8m) wide over all, and carried the railway about 25ft (7.6m) above the river on four freestone arches of 40ft (12.2m) span with piers 9ft (2.7m) wide. Each arch is of segmental elevation with a rise of one third span and arch rings 2ft (0.61m) deep. No evidence was found for any former parapets. No drawings or specifications survive, but preservation work allowed detailed examination of the structure. The piers were evidently erected within cofferdams as agreement could not be reached to dewater the site by temporarily dewatering the dam at Milton mill (NS33NE 51). The W pier is founded on a hard wood platform 5ins (127mm) thick at a depth about 6ft (1.8m) below normal river level, and rests on sand, gravel and weathered bedrock. The timber is saturated but hard, and continues in use; the other piers are probably founded similarly. 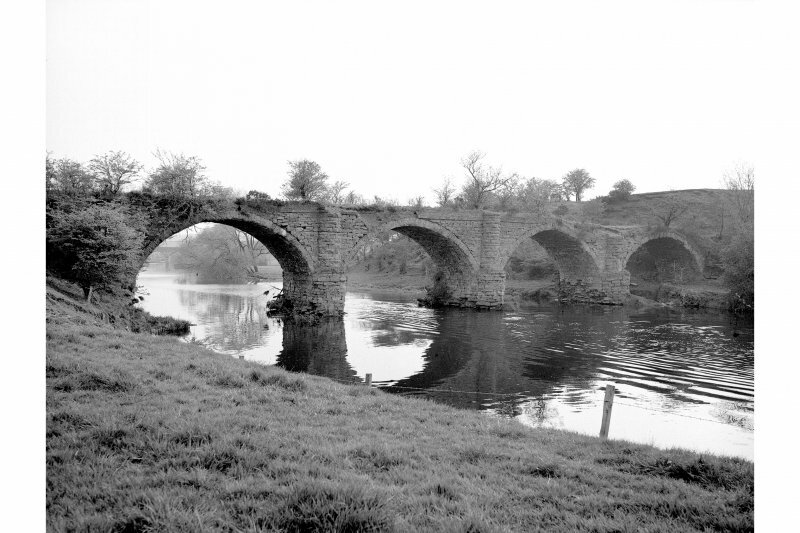 The poor quality local freestone had eroded more than a foot (0.3m) at and near water level on all the piers, particularly at the W pier, but the foundation courses proved to be of hard stone in good condition, which greatly facilitated the preservation of the viaduct. The internal pier hearting comprises thin flat stones bedded and set in lime mortar, and carried up to 5ft (1.5m) above the arch springings. This effective and traditional feature probably saved the structure from collapse. 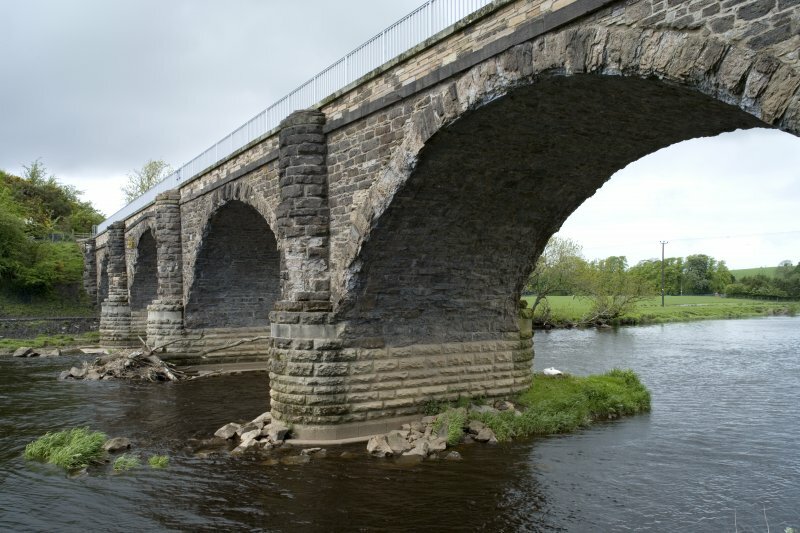 The spandrels are of coursed rubble masonry; gravity-acting retaining walls each run the full length of the viaduct, and vary in width from 1ft (0.3m) at the top to 3ft 6ins (1.1m) at a depth of 9ft (2.7m) by a series of internal steps. The distance between wall-faces is 12ft (3.7m) at depth, the steps being lined up by malleable iron pins, one of which was found in the top of the W arch. The walls simply rest upon the extrados of the undressed archstones without any lateral support apart from any buttressing effect from the bullnoses. 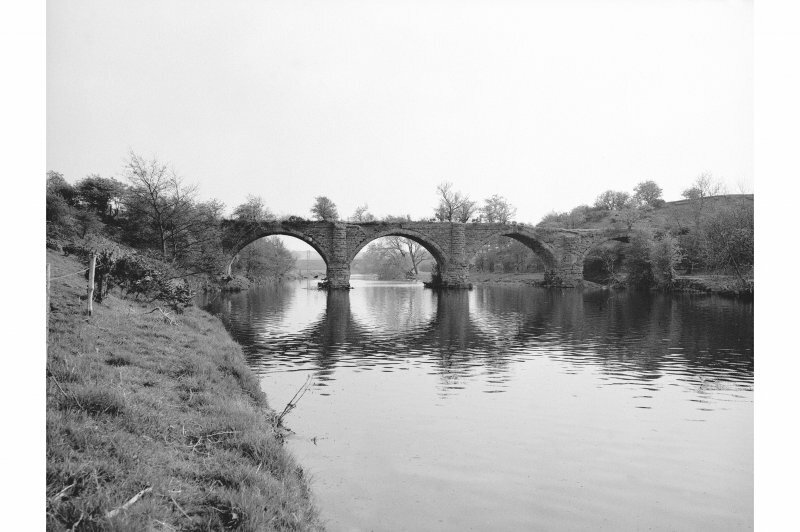 The internal spandrel drainage provision comprised a pair of 8in (20mm) diameter holes through the hearting of each pier down to or below water level. The cavity between the spandrel walls had been filled with stiff clay containing some gravel and resembling boulder clay; this had contributed to spandrel bulging. During the removal of vegetation, a layer of small broken stone was found at about the former track level, and presumably formed the horse attendants' path. Three broken plate rails were also found at this level. The different masonry elements were not well tied together, notably the pier bullnoses to the spandrels and between the spandrel walls. Some bulging had occurred, notably to the south spandrel wall. Up to several inches of masonry had been lost from much of the external facing, on account of the use of minutely fissured local freestone which had deteriorated through weathering. This structure was not built on a particularly large scale for its date; construction followed practices normal for the late 18th century. It was reopened on 29 October 1996, being restored as nearly as possible to its original 'handsome' state. [Numerous illustrations showing elements of construction]. 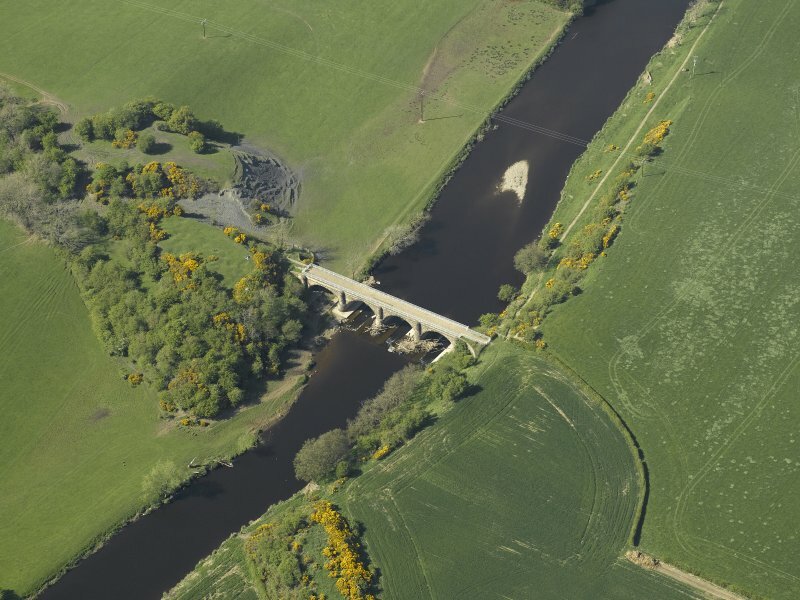 This now-disused railway viaduct formerly carried the Kilmarnock and Troon Rly over the River Irvine to the W of West Gatehead steading. 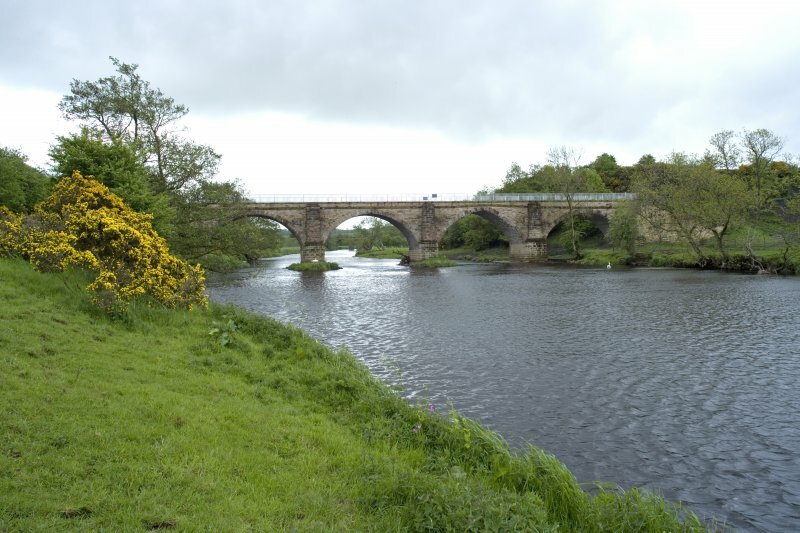 The river here forms the boundary between the parishes of Kilmaurs (to the East) and Dundonald (to the West). The viaduct is depicted, but not noted, on the 1984 edition of the OS 1:10,000 map. The location assigned to this record indicates the approximate midpoint of the structure. The available Map (GIS) evidence indicates that it extends from NS c. 38305 36908 to NS c. 38374 36899. Information from RCAHMS (KD), January 2003, (RJCM), 13 April 2004 and (RJCM), 18 May 2006. Part of the Kilmarnock and Troon Railway which was originally built by the Duke of Portland to take coal from his Ayrshire coalfields to his harbour at Troon. 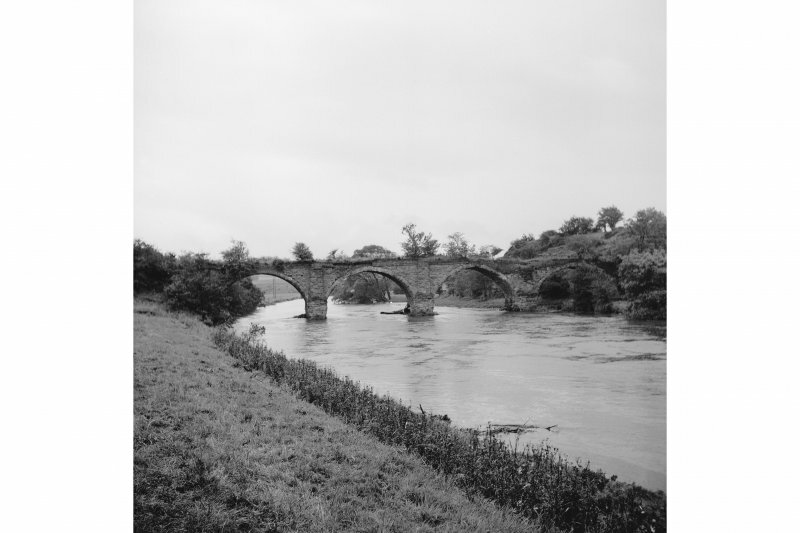 This structure, believed to be the world’s earliest surviving viaduct on a public railway, carried the track about 25 ft above the Irvine on four 40 ft span local freestone segmental arches. It is about 270 ft long, 19 ft wide overall and was built from 1809–11, probably by Telford’s ‘treasure of talents’ John Simpson. The engineers were Jessop and Hollis. Wilson acted for the Duke’s interest. 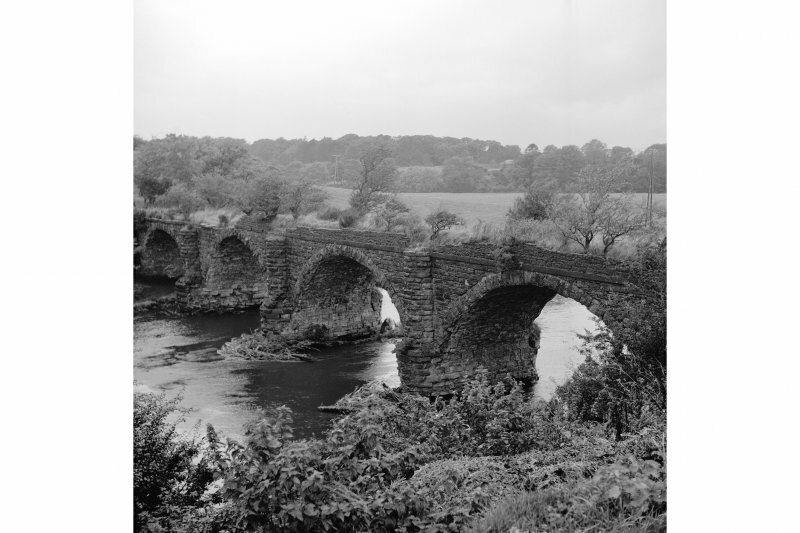 The viaduct was closed in 1846 and bypassed in 1847.
directors raised £1.065 m, bought the viaduct for £2 and, in 1995–96, it was restored within budget on a designand- build contract basis by Barr Ltd. On excavation of the deck, the outer walls were found to be acting as gravity retaining walls with boulder clay infill between. They derived some lateral support from bull-nosed buttresses above the piers. The 23-arch masonry viaduct which dominates the centre of Kilmarnock was built in 1848 and designed byJohn Miller, engineer to the Glasgow, Paisley, Kilmarnock and Ayr Railway. 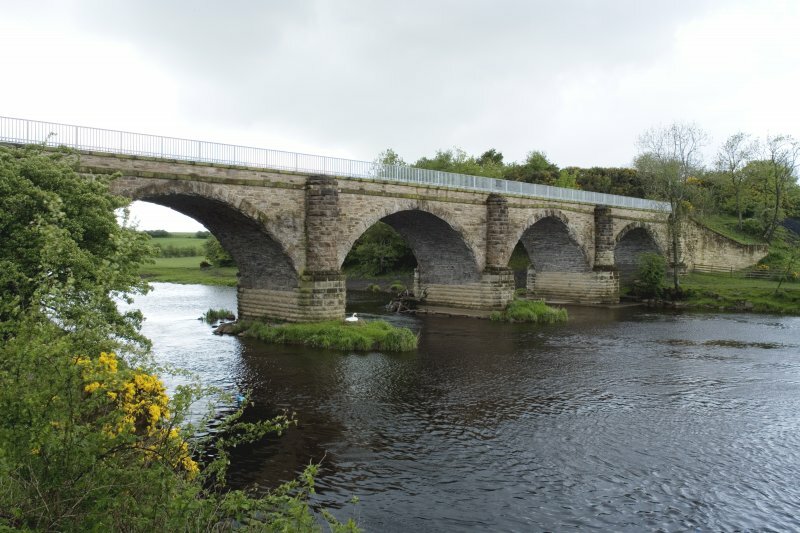 He also directed the upgrading of the Kilmarnock and Troon which was re-opened in 1847, at Laigh Milton, on a timber viaduct just upstream of the old viaduct, which was in turn bypassed by the present operational railway viaduct in 1865.